Britney Spears has launched Rainbow Fantasy. The new fragrance for women is a flanker to 2005′s Britney Spears Fantasy. Rainbow fantasy BRITNEY SPEARS™ is a colourful escape to a vibrant world filled with joy and new possibilities. Dreamy and romantic, this sensual new fragrance makes you believe in the power of fantasy. What colour is your fantasy? The fragrance is a vibrant dream that opens with colourful fruits that blend into dewy, luminous florals leaving an airy kiss of crystalline amber wrapped in soft, prismatic cotton candy. Additional notes feature lemon caviar, cloudberry, pear, peony, lily, jasmine, amber and woods. 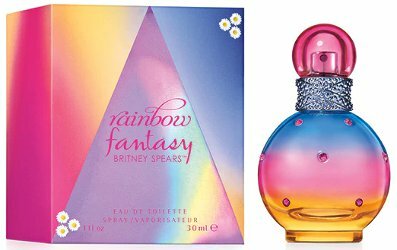 Britney Spears Rainbow Fantasy is available in 30 and 100 ml Eau de Toilette. what in heaven’s name is “lemon caviar”?! I read that and thought exactly the same thing! It’s a fantasy note, silly! Yeah, I am reading that as a salty or maybe inky note along with the citrus.